As you might have gathered by this site's name, one of my most noticeable features is my hair. Thus, keeping my hair healthy and looking its best is very important to me. Having been a natural blonde throughout my youth, I've had to get a little help from the salon in keeping that color in my adult years. And as we all know, the coloring process can put a lot of stress on even the healthiest of hair. So when I was contacted by Misikko Beauty to review the ultra-chic HANAair Professional Hair Dryer, I was beyond excited to give it a try. A hair dryer that promises to actually make your hair healthier with use? I'm all in! I'll admit I was skeptical at first, as conventional wisdom has always taught that hair dryers are bad for your hair. But from the very first use of the HANAair dryer, I could see a noticeable difference in the look and feel of my hair. It was shinier, sleeker and much more smooth. What's the secret behind HANAair's performance? It's actually a combination of three things: 2300 wattage power, pure tourmaline crystals and a ceramic heater. As someone with very thick hair, it usually takes me forever to dry my hair! But with the 2300 wattage power, the HANAair dryer cuts my drying time by at least half. That alone saves my hair from the damage that can come from longer heat exposure with conventional dryers. And the faster drying time has meant that I'm out the door faster and have actually made it to appointments ON TIME (a rarity for me!). The tourmaline crystals and ceramic heater combine to give the most advanced far infrared ionic heat possible. What this basically means is that your hair will have less frizz, more shine and healthier radiance with each use. My hair is not only thick, but it's also very frizzy when I use a conventional dryer. Those stray, curly hairs that stand up all over the place after drying have always drove me crazy! But with the HANAair dryer, my hair was much more smooth with just the first use. The extra long cord is another favorite feature of mine. I hate when I am drying my hair and need to reach for something, but can't due to a short cord. With the HANAair dryer's cord, I can move all over my bathroom with ease! I also used two products that Misikko sent to me for review along with the HANAair dryer (as well as all of that other gorgeous swag pictured above...thank you, Misikko! ): HANA Shine Shield Thermal Protectant and Paul Mitchell's Leave-In Conditioner. Between the products and the HANAair dryer, my hair has never looked healthier! I honestly never would have invested much money in a hair dryer before (the HANAair dryer retails for $314 but is currently on sale for $194.99 with free shipping). Now that I've seen the difference firsthand, though, I could never go back to my cheaper, department store dryer. 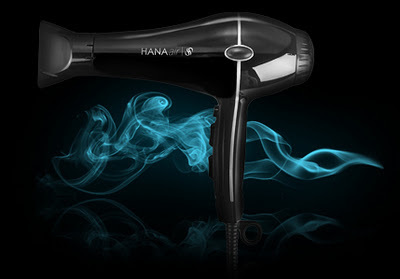 The HANAair Professional Hair Dryer is the only dryer I will trust my hair to from now on! Disclosure: I received a complimentary HANAair Professional Dryer to facilitate this review, as well as other complimentary products to thank me for my time.